﻿"Why is my Leopard Gecko Not Eating?" First off, I want to say some things that may ease your worries if you are new to leopard geckos and even most reptiles in general. For one, geckos will naturally go off food for long periods of time. This is completely normal, and unlike most typical mammalian pets, they don't require food every day, or even every week for that matter. In the wild they will even go the long cold season without eating at all. Naturally, their activity is very low during this time as well. They are well adapted to this process and we must consider this natural behavior when we make assessments to their health. A leopard gecko going a few weeks without food will not hurt them at all. I have seen them go a few months and then bounce right back. Extreme thinning of the tail and pronounced backbone are signs to look out for — not how many mealworms they've eaten this week. All this being said try to relax as stress factors are typically the biggest issues you will face in getting them back on food. Did you just recently received a new gecko and it is not eating right away? ​First off don't panic...this happens regularly. Most geckos that don't eat right away are doing so because of stress: stress due to shipping, new environment, different food/supplementation, and especially due to extra contact and activity within the enclosure or visually around the outside of it. You should have received a starter guide with your shipment that emphasizes a very hands off approach to getting your gecko adjusted to his/her new home and I will continue to emphasize that here in depth. It is so very important that you eliminate all stress factors at this time. This especially means no holding or direct contact with the gecko until it is fully adjusted and eating well on it's own. Here are some guidelines to make sure you are doing things correctly and to make sure you ease your gecko in the transition process the quickest and healthiest way possible. Make sure your temps are correct. For a terrarium get the surface temps about 90-92 and ambient 78-84 on the hot side. If the temps are too low this can cause them to go into a period of inactivity. Too high and it can stress them more, dehydrate, and even kill them. Put the moist hide over the heat pad on the hot side. The moist hide is a favorite hang out for geckos so when placed over the cool side it will encourage the gecko to hang out in a colder than ideal location in the enclosure. Lighting: If you plan on using lights for heat, it is best to use a ceramic heat emitter or a red/blue nighttime bulb (reptile specific ) on a dimmer. I suggest only using these during daytime hours. This gives them a period at night where all the lights are out. Do not use any bright lights in the terrarium as this will cause stress and hurt the geckos eyes. With proper supplementation UV lights are not needed (don't let the "internet experts" tell you otherwise). Remember that heat from overhead lights should only be used to supplement under tank heating. Put temporary "blockers" over all the sides of the enclosure and move the enclosure to a quiet place away from all activity. People and pets are looked at as predators by geckos (especially young ones). It is crucial to block out outside activity with paper (or any type of visual blocker that can be temporarily taped around the outside of the of the glass) to help limit the gecko's view to the outside world. Also eliminating outside activity in general is very important so make sure to move the gecko to a quiet part of the house that also has a long period of darkness provided at some point during the day. Geckos feed during the low-light/nighttime hours so this is also crucial. Also, geckos can hear quite well so loud noises and heavy foot steps should be avoided. Food items- Your gecko has been eating mealworms (younger geckos) out of a shallow bowl exclusively up until this point. I recommend not feeding the gecko right away (2-3 days) when first acquired to help with the stress going down and the prey drive going up. If the gecko isn't taking food after a week then I recommend putting the bowl of mealworms (20-30) in front of the humid hide. Leave them in a day and then take them out completely for two. Then put fresh ones in for another day and repeat the process. This keeps the gecko from getting overstimulated by food being constantly in their face. I have never seen a gecko not eventually take to food this way as long as the other conditions and stress factors are correct. Other food items may be tried but it is very important to remove any crawling insects (crickets, dubia, loose superworms, etc.) within a couple hours as they can stress your gecko more. Mealworms in front of the moist hide is almost always the most successful approach. Supplementation: Although this is very unlikely the problem it still can be a contributing roll and is very important to get right. Buy Vionate and Osteo Form (or Osteo Form SA). Mix them in a 1:1 ratio (Vionate: Osteo) and keep a side cap or petri dish of it somewhere easily accessible. Although, I personally don't use it, the RepCal D3/Herptivite should work fine as well. Do not house your geckos together to start. It's always better to keep geckos separate for their entire life but at this time it is very important. More on this on my main CARE page. And lastly, I hate to keep going over this but please keep contact and activity to a minimum. No unnecessary; handling, peering into the enclosure, hand feeding, picture taking, vet visits, etc. You should literally only open the enclosure and see the gecko every 3 days or so to change out food and provide a little water. Leopard Geckos can go months without food and weeks without water so this is not the a major concern. Literally, my procedure on receiving a new gecko is put them in their lightly misted and heated tub in a rack, feed them after about 2-4 days, and leave them be for at least a week. Then, I will put them into the normal routine. This hands off approach works for me 99.9% of the time. Stress is the number one problem new keepers face when getting a new gecko! ​For breeding age females this is typically the cause. The signs are a lack of appetite, swollen belly, thinning tail, and 2 pinkish pencil eraser size dots (follicles/ova) on the underside of belly. 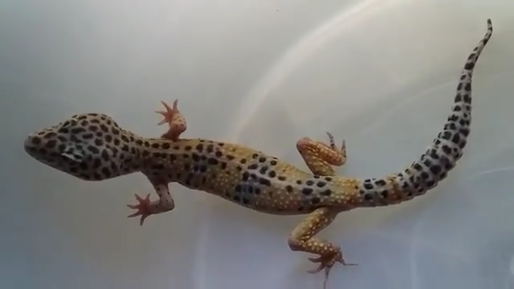 One of the most common questions I receive during the spring and summer (typically February-July) is “why isn’t my gecko eating?” Well, the answer is typically the hormonal and physiological changes in the females as their bodies prepare to lay eggs. During this time their appetite decreases or even becomes nonexistent for around 1-3 months. In the wild geckos (males and females) go long periods without food (colder months) and then gorge themselves when food is plentiful. There is no reason to worry about a female not eating during this time as she will eat when ready. Just make sure to provide fresh water and a good humid hide during this time. Food can be offered for a day then removed for a few, and then repeat. When she is ready she will eat. If you are planning to breed your gecko, this is the time to pair with a male. Once she lays eggs (typically 2 weeks later) she will need extra food and supplements to prepare her body for the next clutch. Sometimes the gecko you have brought home will not accept foreign prey items. Most geckos will switch over if allowed to become hungry enough but occasionally you will get a stubborn gecko that would rather starve. Typically this occurrence is in combination with an overload of stress. It is always best to start off with mealworms in a shallow bowl as they are the least stressful for a new gecko and most commonly eaten. Other common food types are Mealworms, Dubia (and various roach species), Superworms, Crickets, Butterworms, Waxworms, Solder Fly Larvae, ect. Most geckos will take to mealworms first but for a stubborn eater it's worth it to try some different foods. It is very rare that one of our geckos won't take mealworms as they were raised on them. Make sure to read through my Leopard Gecko Care Page to help identify any husbandry issues you are experiencing. Typically improper temperature and lack of proper humidity can be a leading causes of appetite issues. Buying from questionable sources can sometimes lead to this problem. When receiving a new gecko always keep them in quarantine away from the rest of your collection. A proactive stool sample may be sent to a vet but I typically recommend waiting until the gecko has adjusted into it's normal feeding cycle first. Stress and other factors can be cause for runny stools and loss of weight. A sick gecko is usually pretty easy to distinguished from a stressed gecko just going off food. The body and tail will sink in very quickly and the color will become extremely dull. Consistent runny and odd colored stools can be a sign as well. When receiving a new gecko that seems to not want to eat it is best to not run them directly to the vet. 99% of the time eating issues are stress related so doing this will compound the problem exponentially. If you must, run a stool sample alone instead of the actual gecko. If you purchased a gecko from us, we house all our geckos alone and are careful to not allow for any sort of direct or indirect contact between animals. We also practice strict sterilization methods including high temp steam, chemical, and UV sterilization. We also regularly perform our own fecals on-site and send off for PCRs in our breeding colonies. Point is typically purchasing from us you can be very confident this is not the cause so look to the stress factors first. 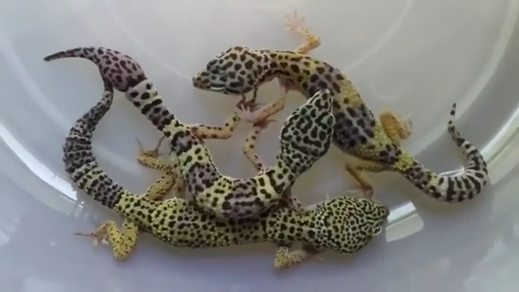 The pictures below are actual wild leopard geckos for reference. This is not ideal body condition for captivity, but it does support that most captive leopard geckos are overfed.